What Does Cold Damage On Tropical Plants Look Like? When the first little bit of cool weather hits it’s a nice change from the summer heat. The problem is we forget! We forget to bring in our tropical plants what enjoyed the summer outside. The cold front got things a little more “chilled” then we expected. Now that a few days have gone by the leaves are starting to drop in bunches or the leaves are black or even greasy looking. Some plants only hold naked branches waiting for clothing, a single leaf is only a memory. Can the plant be saved? The answer to those questions as with so many things in life – it depends. How cold was the temperature? How long was the plant exposed? What was the health of the plant before the damage? 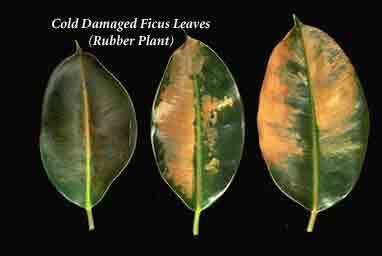 Some plants only show burned leaves, other may need a severe pruning and others, you need to say goodbye. For more in depth details of what you can do visit this article on cold temperatures, plant growth and tropicals.